I recently had the pleasure of speaking to graduate students at Depaul University in Chicago about the future of work and internal communications. Looking back on this talk I was surprised and delighted because it was not only a chance to talk with students about the future of work that’s unfolding within organizations, the talk was an opportunity to reflect for a moment on my own career journey. It was a chance to give back and share what I’ve learned as I’ve seen and experienced first hand how internal social media, community management and other elements of the future of work are transforming and involving the conversation between companies and their employees, making it more transparent, meaningful and relevant behind the firewall. Here are a few of the presentation slides, highlights of what I shared, plus a few extra thoughts and post-presentation reflections mixed in. As I mentioned in my working out loud like a toddler post, my son has challenged me to think about what the future workplace will be like. Seeing the world through his eyes inspires me to think about the changes we need to make today in the workplace to create the best possible future work experience, a work experience that won’t hold back or limit employees but instead will inspire and empower future generations to thrive at work and in their careers. This new way of thinking isn’t just about technology. It’s also about changing that way we approach management, leadership and give employees the tools they need to be inspired about the work they do. 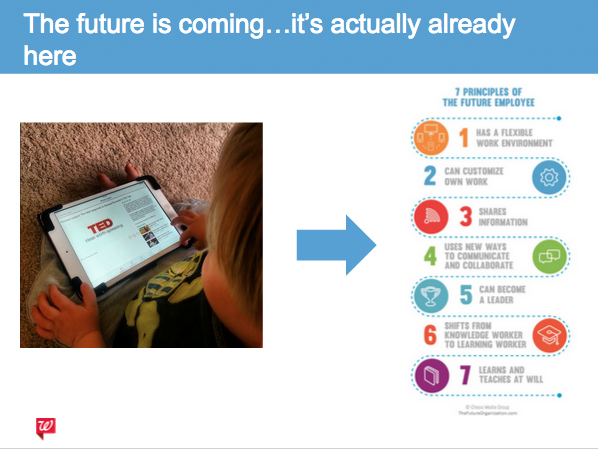 To explain some of the key behaviors that employees will be exhibiting in the future, I shared a picture of my son watching a Ted talk on an iPad and related it to the Seven Principles of the Future Employee that Jacob Morgan has spoken about in his book The Future of Work. Watching my son grow up and watching how he uses technology to learn about the world around him, it’s obvious to see how today’s workplace must evolve. Organizations must be ready for my son’s generation. But what I stressed was that many of the elements of the future employee and the future of work are already here. I told the grad students that the organizations, at least the ones that want to be relevant and in business 10 years from now, need to adapt to the reality that’s coming and one that’s already here. Looking at my son, I can’t help but see the importance of championing these new ways of working today. He’s going to expect to have these tools to do his job, and if employers don’t change and adapt these new tools and management approaches they’re going to have very frustrated and disengaged employees. And even worse, those employers who don’t evolve will be seen as “behind the times” and won’t attract the top talent and thus will be at a competitive disadvantage in the marketplace. I explained that those entering the communications profession have a tremendous opportunity to be champions and change agents themselves. I encouraged the students to not be a spectator in the future of work. Be an active catalyst for change where ever you work. Put yourself out there. Take risks. Experiment. Challenge yourself and others no matter where you sit in the org chat (if the org chart still exists.) Make mistakes and learn from them. Always be improving. Figure out what works and what doesn’t. The career path always favors the risk takers, linchpins, and early adopters. And when companies allow ALL their employees to think, act and work in this new way, the company is at a significant competitive advantage in the marketplace. I told the students that they can influence the future of work regardless of age or work experience. I encourage them to be bold and be courageous when they face adversity in the workplace. I was also real with them. I explained that though it’s an inspiring opportunity, it’s not without it’s challenges. Road blocks are certain to come. I’ve faced many in my career and I expect many more to come my way. I shared with them a glimpse into how rolling out the future of work at any organization, large or small, is like running a marathon. And if they weren’t long distance runners yet, they should consider starting because it’s a great metaphor for the exciting challenge that lies ahead. Sharing a few personal experiences of when I had to push back and challenge my managers and leaders during my career, I explained how many of the old ways of working are still deeply engrained in organizations and you will get push back and resistance. Bet on it. Embrace it, I told them. See it as opportunity to grow and develop yourself. If you don’t embrace it, you’ll get frustrated and stop making progress. You must push on and not get discouraged by setbacks. Why push hard against adversity? Because that’s where the real learning comes in. I’ve learned a lot from my mistakes and successes. Yes, without a doubt it’s an immense challenge to transform a company from the old ways of working and lead them into the future of work. What I’ve learned over the last five years at Walgreens has been priceless and each day that goes by I’m reminded of what I learned, and I challenge myself to apply what I’ve learned to in the past to help me in the present and plan for the future. Because that’s what the future of work is all about. Fail quickly so you can learn quicker. And improve faster. I only had a short time to talk and I wish I had more time, but what I did share was that I love the rewarding feeling of being part of something bigger than myself. I love the opportunity to help fellow co-workers and leaders do their jobs better. Connecting people and building relationships is what inspires me, and it’s one of the things I love about what I do for a living. Yes, it’s hard work. But it’s worth it because I know that my work doesn’t just impact the company but it goes beyond the firewall and helps customers too. It was fun sharing this above slide because it was a chance to reflect back on and unpack a bit of the-way-ahead-of-it’s-time wisdom from the Cluetrain Manifesto. It was amazing to see what’s evolved, and what’s not, since Cluetrain first came out in 1999. 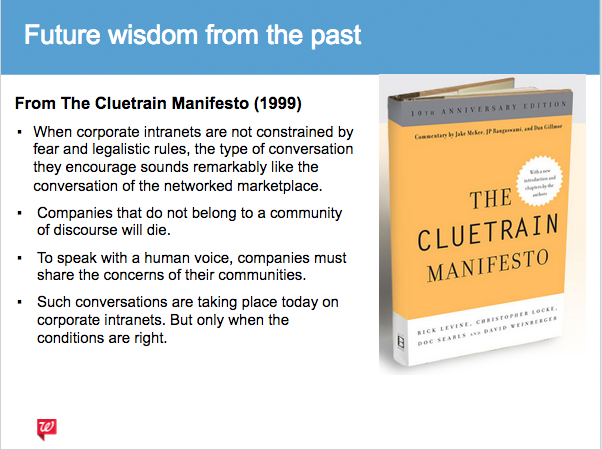 Looking at the Cluetrain Manifesto in context of internal communications and community management was a blast as I focused on a few key areas; corporate intranets, importance of communities within organizations and the need for a human voice. I explained to the grad students how we are working hard at Walgreens to integrate these concepts into our daily flow of strategic internal communications. I shared personal stories of how over the last five years I challenged both myself and others at Walgreens to put the concepts of the Cluetrain Manifesto into action. I explained how it takes bold thinking and courage to step from behind the proverbial and unfortunately pervasive corporate curtain and speak to employees in a real human voice that’s honest, vulnerable and transparent. I shared stories of how I’ve taken risks (and reaped the rewards) during my journey into the future of internal communications. I explained how we utilize technology like Enterprise Social Networks and concepts like Working Out Loud to have real, meaningful and transparent conversations with employees. I shared examples of how members of our corporate communications team have modeled the behaviors of the Future Employee and The Future Manager. And most of all, I stressed the importance of not thinking that it’s all about technology. 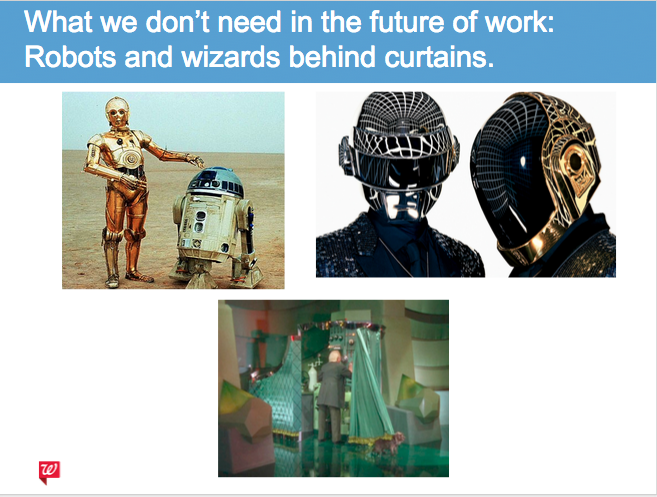 Yes, much of the future of work does involve using technology and though I am a big fan of Daft Punk and their robot rock, we don’t need to be robots or be robotic in how we work in the future. We’ve already done enough of that in the past. It’s time to be human. The future of work needs leaders who are human and are courageous enough to reprogram the system with their humanity. Leaders that are brave enough and smart enough to be vulnerable, admit and learn from failure, embrace their humanity and use all those human elements to transform the workplace and how we work. Why is being human so important for the future of work? Because, honestly, at the heart of the future of work are humans, humans with which we need to communicate and engage with in an authentic and personal way. Humans that need to be cared for and guided mindfully and thoughtfully along the way. Humans that need to be encouraged and told (often) that it’s okay to work is this new way. Humans that need leaders to show that the future of work is blessed by the organization and is top priority for the company. Humans that need to be led through this new and often scary behavior change. Okay, so I made the point that you can’t have the future of work without real people and we shouldn’t be fooled into thinking that just because IT rolls out new technology that employees will know exactly how to use it and know exactly how it should be integrated in to their daily flow of work. The other important things we need are leaders and partnerships. Looking at the five trends of the future of work we clearly need leaders at all levels of the organization to guide the workforce. We need to look at leadership differently. From the C-suite to the front lines, I believe we need everyone to be empowered and to have a sense of leadership and ownership of the future of work. The challenge, and opportunity, ahead of us is to complex to only have a few people leading the way and charged with guiding employees through all the psychological, emotional and sociological parts of the human experience that’s unfolding before us. Traditional hierarchies, old ways of management, and department silos won’t get us to where need to be. I’ve seen progress in other companies who are making inspiring changes but we need to continue to push to make it the future of work a reality not the exception. I ended with the truth I’ve shared with other audiences stressing to the students that it’s critical that strategic partnerships are formed between communications, IT, HR and legal. Those areas of the company must find a way to work together. They must have a shared vision, a clear roadmap and a unified purpose to make the future of work a reality for their organizations. It’s been a key element to success of our community and collaboration initiatives at Walgreens. And if those partnerships are not formed and a priority, the future of work will only be a fragmented effort with limited impact and worse, a failure. It was a blast and huge pleasure to speak to students about the future of work and internal communication. And I loved the conversations I had with the students afterwards. Special thanks to Ron Culp for making this talk happen and I hope I inspired a few brave and courageous souls to join the journey. 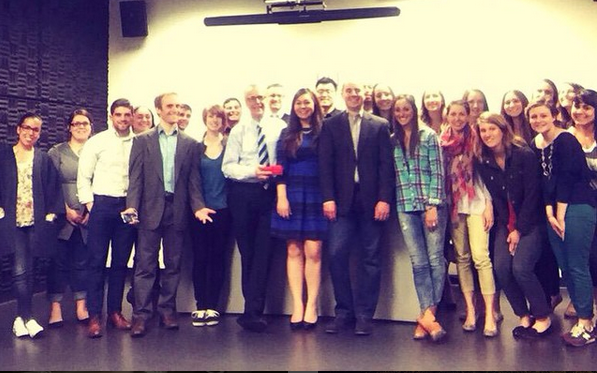 And judging by those chats I had with students, the future of work and internal communications looks bright, indeed.